In a large mixing bowl, whisk together the flour and baking soda. Set aside. In the bowl of a stand mixer fitted with the paddle attachment, cream together the butter and sugars for 1 to 2 minutes or until well combined. Incorporate the egg and egg yolk, one at a time, then vanilla extract and mix well. Slowly add the flour mixture on low speed and continue mixing until just combined. Scrape down the sides of the bowl as needed. 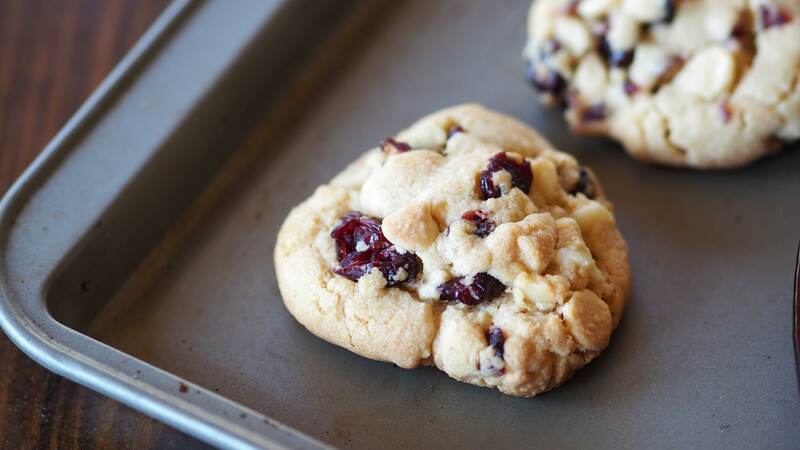 Add in the white chocolate chips, macadamia nuts, and dried cranberries (if using). Cover with plastic wrap and refrigerate the dough for 30 minutes or up to 5 days. Bake, one prepared sheet at a time, in the oven for 8 to 10 minutes or until the edges of the cookies are lightly golden brown and the top is set. Remove from the oven and cool on the baking sheet for 5 minutes, then transfer the cookies to a wire rack to finish cooling.